Technical analysis is an integral part of mastering covered call writing. This week’s article is a follow-up to an article posted on October 19th. In this week’s column I will discuss the MACD histogram which represents the difference between the MACD indicator and its trigger, the 9-d EMA (exponential moving average). It is plotted in the form of a histogram (bar graph) rendering divergences and centerline crossovers easily identified. A centerline crossover (i.e. the histogram bars move above the centerline) into positive territory. This is equivalent to the MACD moving average crossover signal, in which the MACD moves above (for a bullish signal) or below (for a bearish signal) its trigger line. Increases in the positive histogram (taller bars) show strengthening momentum. Positive divergence of the histogram will usually precede a positive move of the MACD itself. A centerline crossover (i.e. the histogram bars move below the centerline) into negative territory. This is equivalent to the MACD moving average crossover signal, in which the MACD moves below (for a bearish signal) its trigger line. Increases in the negative histogram (bars are longer under the zero line) show strengthening momentum in a negative direction. Negative divergence of the histogram will usually precede a negative move of the MACD itself thereby giving us an earlier warning signal of a potential price decline. Bullish signals are highlighted by the blue arrows where the histogram bars move above zero and the price of the stock then rises Bottom half of chart). Bearish signals are noted by the red arrows where the bars drop below zero and the price of the equity then declines. It is important to note that these histogram signals occur before the MACD itself (black line) moves above or below zero. This is why I prefer the histogram…it is a quicker indicator of change. 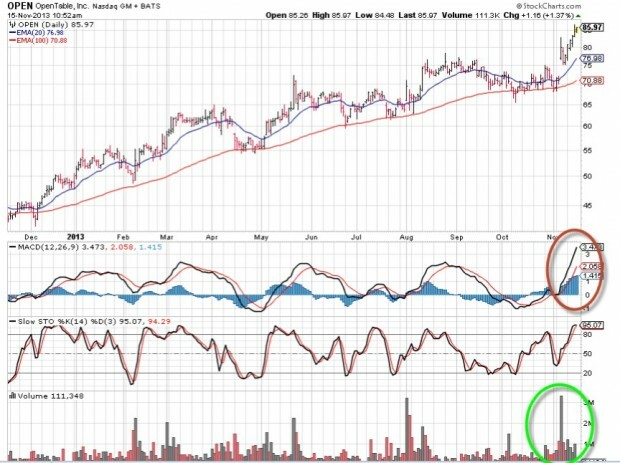 A widening gap between the MACD and its trigger line (also known as the histogram which is the difference between the MACD and its trigger) shows strengthening momentum, while a shrinking gap will demonstrate weakening momentum. A bullish signal occurs when there is positive divergence or a widening gap between the two and a bullish centerline crossover. A bearish signal exists when there is negative divergence (closing gap between the two) and a bearish centerline crossover. Notice in the above chart how the histogram provides a bearish signal before the MACD (January, 2010 for example)) and a bullish signal prior to the MACD (March, 2010 for example). Specifically, the histogram crosses the zero line before the MACD itself. Therefore it can be said that the MACD and the MACD Histogram are independent of each other. Divergences are apparent before MACD moving average crossovers. Can be used to signal impending reversals. Easy to read and quick to interpret. MACD and the MACD Histogram are two of the more reliable technical analysis tools available to us. They incorporate both trend-following and momentum identifying qualities and are predictive in nature. As with other technical tools, they should be used in conjunction with other indicators to assist in painting a picture for potential buy/sell decisions. For the week, the S&P 500 was up 1.6% for a year-to-date return of 28.5%, including dividends. Last week I enrolled with your premium membership and frequently monitoring the stocks indicated in your watch list. I would like to ask a question which comes in mind when I try to choose stocks for covered call writing. What I noticed that that price of most of your stock are trending higher which means they are very pricey and a huge probability for price drop. Do you agree with this? Usually I thought we should buy stock which are below 20 or 100 ema so that they can easily move up but according to your strategy, your list provides stocks which are above 20 and 100 ema. If you could explain the reason that why I should buy stocks at a higher price that would be great? Also, I usually think that out of money call is always good but you mostly show in your examples in-the- money call options. What would be the best option out-of-the-money call options or in-the-money-call options? If you can explain this so that I can truly understand what and how to select my stocks. Welcome to the BCI community and to our family of Premium members. 1- In our BCI methodology we are undertaking a 1-month obligation. The best securities to select are the ones with positive upward momentum as opposed to negative downward momentum. We can re-evaluate each month but many stocks stay positive for long time frames because they are simply great companies generating outstanding profits and revenues (see the chart below). 2- The price of a stock is relative to the time frame being evaluated. AAPL once seemed pricey @ $75! All the securities that “earn” their way onto our Premium Stock List have outstanding fundamentals and technicals as well as meeting our common sense screens. There are no guarantees (that’s why we are prepared with our arsenal of exit strategies) but the odds are stacked in our favor. 3- Strike price selection is critical and too many cc writers ignore this aspect of the strategy and simply write OTM calls in all situations. This is a big mistake. As a general rule, when the situation dictates selling OTM calls is desirable. This is because we can generate 2 income streams…one from the sale of the options; the other from share appreciation if the stock price moves up to the strike. However, in a bear market environment or if chart technical a mixed rather than all bullish, having the protection of an ITM strike will be beneficial. There is nothing wrong with generating a 3%, 1-month return and having a 5% downside protection of that profit (I’m not talking about breakeven, I am referring to the intrinsic value of the premium protecting the time value of that same premium…a detailed explanation is found in my books/DVDs). Thanks for those excellent questions. 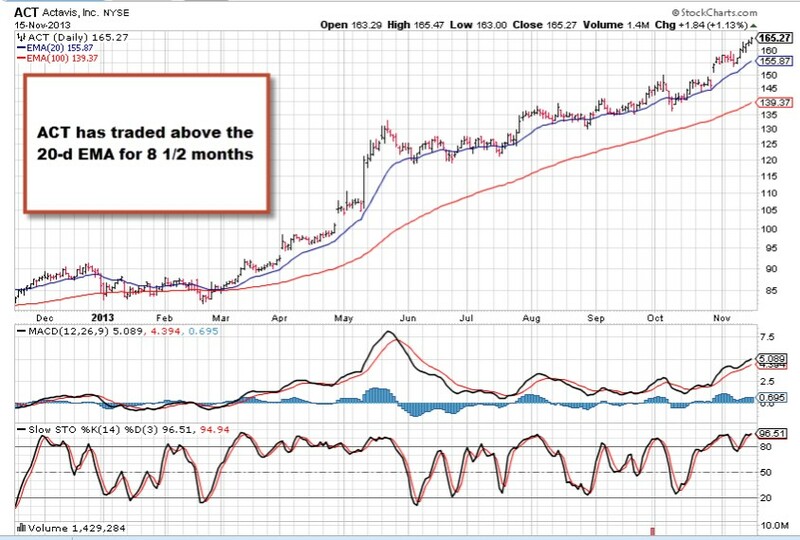 See the chart below for a stock on our premium watch list for over 4 months now (CLICK ON CHART TO ENLARGE AND USE THE BACK ARROW TO RETURN TO THIS BLOG). The Weekly Report for 11-15-13 has been uploaded to the Premium Member website and is available for download. 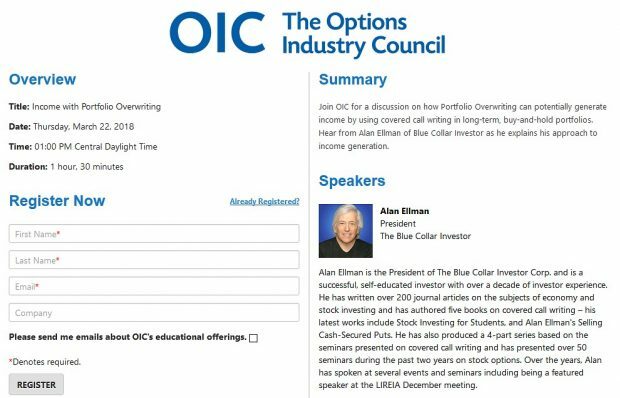 Hi Alan: I am a recent BCI premium member. My question is what does one do when holding a watch list stock during an option month which drops off the running list during that month? 1- Once a cc position is entered it is managed as detailed in my books and DVDs, not based on its placement or removal from our Premium Stock list. 2- If we hold a stock (whether it has moved up or down since purchase) about to report earnings, it is always to our benefit not to write the call until after the report passes. Our choices then are to hold the stock until after earnings and then sell the call or to sell the stock and use the cash in another position. This is a choice you need to make before earnings. Most of the time, moving to another position is the most appropriate choice unless you have confidence in a positive report (THO has had mixed results in the past year- see chart below). 3- A comment: One of the reasons for the price decline for THO was the $100/contract dividend distributed on November 1st. Whenever a dividend is distributed the share price moves down by that amount. Check your brokerage account to make sure you did receive this cash dividend. The MACD indicator and stochastic looked so strong for OPEN and JAZZ that I purchase the stock and sold the Dec13 calls that were the closest to the stock price at the time. I received $2 and $2.50 per contract. Within the week the stocks have rallied huge and the calls went ITM and are priced much higher than I sold, and my upside is limited. What are your thoughts on selling OTM calls on half the holdings and waiting to see how the stock does to sell the same strike price call but at a much higher price? This would lower your breakeven point and produce more income. Or sell another call for half the holdings but with a higher strike price, so you could participate in the stock gains if the stock gets called. You’re in a great position with these 2 stocks. You have currently maxed your profits early in the contract and worst case scenario will sell the shares at the price you origianlly felt comfortable selling them for. However, as Blue Collar investors, we want more…right? Keep an eye on the time value of the premiums you originally sold. One of the characteristics of a deep in-the-money strike (share price keeps moving higher) is that the time value will approach zero. This means our cost to close the entire position will be near zero. For example, had you sold the $75 call for OPEN, it would cost you about a half of 1% to close. Had you sold the $72.50 call..about a quarter of 1%. In that case, I will close the entire position and use the cash to enter a new cc position with a different stock and look to generate another 1-3% for the month with the same cash. See pages 264-271 of Encyclopedia for more details…examples also in both DVD sets. We had expiration Friday last week and it’s now time to enter new positions and make option sales…. Do you (generally) do all of your trade executions on the first trading day (usually Monday) after expiration Friday or would you recommend staging them over a number of days this coming week? Because of the erosion of time value of the option premiums (theta) we don’t want to wait too long to enter our 1-month positions. In a 4-week contract (usually 8 per year) it is best to enter within the first 1-3 days of the new contract and in a 5-week contract (usually 4 per year including the current December contract) within the first 7 trading days of the contract. I will normally enter my new positions early in the first week. 1- Selling predominantly in-the-money strikes…the deeper ITM we go, the more protection against a downturn but the lower our monthly returns will be. 2- Selling options with low implied volatility (not speaking of beta which relates to the historical volatility of the security). There is an easy way of managing this approach w/o looking up the IV of every option. When we set our monthly goals, the returns are based mainly on the perceived volatility of the market and underlying securities. If, for example, our 1-month goals are 2-4%, we can lower that in nervous market conditions to 1-3% and will therefore be dealing with lower-IV options. 3- Use ETFs currently in bullish patterns. These will have lower IV and not move (in general) as much as individual equities. In the past, I have written about using the best-performing Select Sector SPDRs which are highlighted in all our ETF Reports. What is the one specific event that causes the MACD line to break above, or below the zero line. Or is there one at all? The MACD drops below the zero line when the longer term moving average (26-d ema) moves above the shorter term moving average (12-d ema). This means that more recent pricing is declining demonstrating slowing momentum, a bearish signal. In essence, that is signaling selling pressure and a red flag of concern. This information is one factor we use to make our final decisions. The histogram will drop below zero when the MACD falls below its 9-d ema.